William Mougayar, Arnold Sternberg, and Kenny Hearn are among the first ICONOMI crypto fund managers. Blockchain fund management platform ICONOMI has announced that William Mougayar, Arnold Sternberg, and Kenny Hearn are among the first in its series of Digital Asset Array (DAA) managers. “ICONOMI is proud of what we have achieved in just twelve months, especially given the pace of other ICO projects in the crypto-economy. Today we welcome the highest calibre investors in the world of blockchain to join us and manage the first cadre of DAAs. The carefully chosen group was selected from a pool of 150 applicants from all over the world, each of whom exceeded the most rigorous criteria, showcased deep knowledge and foresight in their proposed investment policies, demonstrated an understanding of optimal portfolio structures, and came armed with strong track records to substantiate their theoretical expertise. The introduction of DAA managers will further our mission to build a bridge between the old and the new economy,” said ICONOMI co-founder and CEO Tim M. Zagar. Upon the release of the platform in August, ICONOMI introduced Columbus Capital as one of the first announced DAA managers, managing Columbus Capital Blockchain Index (BLX), a DAA representing a majority of the total market capitalization of all digital assets, and Columbus Capital Pinta (CCP), an actively managed, high-performance DAA. Among the DAA managers is William Mougayar, an advisor to organizations such as the Ethereum Foundation and Coin Center. He is currently the General Partner at Virtual Capital Ventures. Mougayar is also Senior Advisor at Cofound.it. “It is a privilege to join ICONOMI as one of the first twelve new DAA managers joining Columbus Capital. Those of us leading the vanguard will begin to bridge the gap between the traditional financial world and the crypto-asset space. 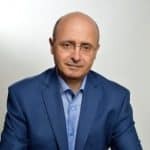 The ICONOMI platform uniquely allows the creation of value from blockchain, professionalizing the world’s fastest growing industry by attracting talent and interest from the best of the institutional and tech worlds,” said William Mougayar. Joining Mougayar as ICONOMI DAA managers are Arnold Sternberg, Managing Director of Cosmic Capital Holding GmbH, and Kenny Hearn, Director of Asymmetry Asset Management. Arnold Sternberg worked previously with companies such as Goldman Sachs and the Allianz Group. He co-founded ProFounders, Kammerlander Sternberg & Cie, Vermögensverwaltung GmbH, and Aeris CAPITAL AG (now Calibrium AG). “ICONOMI piqued my interest a little over one year ago while I was investigating efficient solutions that enable investors to access the quickly emerging blockchain industry. I decided to closely monitor ICONOMI’s progress and, having met with their team, I became a great admirer of the project. I feel honored to have been chosen to oversee and launch ‘Kryptonite CORE,’ my DAA, as one of the first DAA managers. I am excited to be part of ICONOMI and its expanding functionalities, community, and ecosystem,” said Arnold Sternberg. Kenny Hearn has worked previously with companies such as Morgan Stanley, Barclays, Barnard Jacobs Mellett, and Coronation Capital. “As the world of finance adjusts to modern-day innovation, ICONOMI is not only looking to the future, but leading the way. I am delighted to be among the world-class experts in blockchain, finance, and crypto-assets that were carefully selected to become ICONOMI’s first DAA managers, and I look forward to contributing to the success of this project,” said Kenny Hearn.